A pit bull-Labrador puppy is a common breed mix, especially among dogs in shelters. They are typically high-energy dogs that display a mixture of the traits seen in pit bulls and Labrador retrievers. 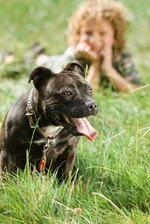 Pit bulls, like all breeds in the terrier group, are active, smart and stubborn. Labradors, bred for hunting and companionship, are high-energy and easily trained. The mix results in intelligent pups that are quick to learn tricks, commands and house-training. Tailor your training program to the puppy's needs in terms of energy level and other individual traits. Feed your puppy a quality puppy food, according to the advice of your puppy's veterinarian. Some pet foods are considered high quality but are not balanced properly for large breeds, such as Labrador retrievers, and contribute to uncontrolled fast growth spurts which cause stress to the joints. Most veterinarians recommend a quality dog food with protein, fat, calorie and calcium levels that promote slower, consistent growth. Feeding a puppy food labeled "for large breed puppies" can help, as can switching your puppy to adult food sooner than is typically done. The puppy's veterinarian is the best judge of this matter, as the size and growth of a pit bull-Labrador mix can vary quite a bit. Take your puppy to puppy kindergarten, basic obedience and puppy socialization groups. These are necessary for your puppy to learn proper doggy social skills and manners, so that the tendency to fight is kept at a minimum. Keep in mind that some pit bulls have a stronger than usual tendency for aggression to other animals. You can't completely alter that, but it will usually be much stronger without consistent, early socialization with dogs and other animals. Take your puppy as many places as you can and provide all kinds of positive and pleasant experiences with many kinds of people, as well as experiences with unusual objects and places, such as skateboards, loud children, buses, traffic and handicapped people. The more exposure your puppy has to many people, places and things, the more well-rounded and calm the pup will grow up to be. Provide your puppy lots of opportunities for exercise. Labradors are large hunting dogs, and pit bulls are strong, active terriers. Both breeds need a lot of daily exercise, both mental and physical. Two or more long daily walks are a must, as is romping off a leash in a safe, enclosed area. Plan activities that provide mental and physical stimulation. The new puzzle toys are a good mental workout. Teach the puppy agility or interesting games, such as hide and seek, to ease boredom. Find ways to engage your puppy's mind. Set limits and boundaries for your puppy from an early age and stick with it. Terriers are tenacious and must have a leader who is firm and fair. Be consistent and provide loving but strong structure to keep your puppy in line.